The main reason we went to Seattle was for a Farmers Achievement club, Matt is one of the TOP 75 District Managers in the US and therefor qualified for this awesome trip! We just went a few days early to have more free time on our own! I have to share with you all how FIRST CLASS this trip was, Awards night was so fun and Farmers brought in Iluminate the group from this years Americas Got Talent to perform for us during the night, this was so fun! 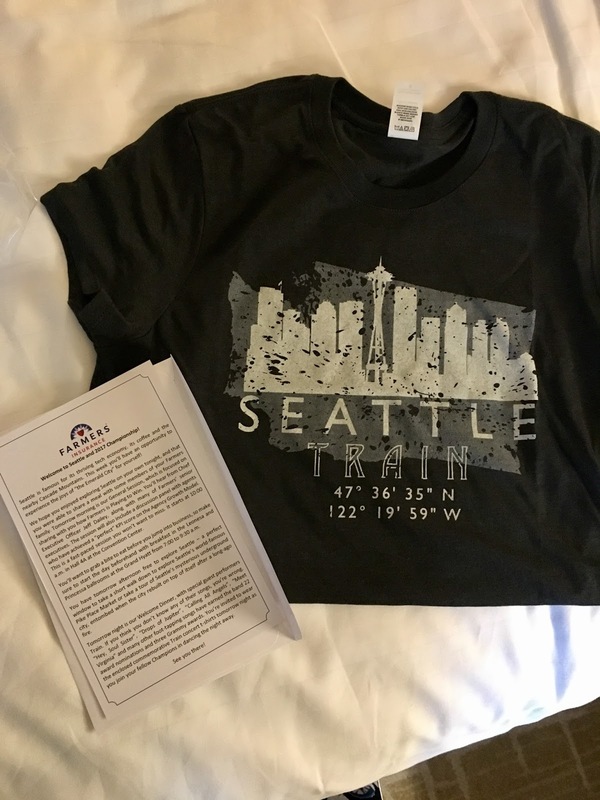 One night when we got back from dinner out on our own (on Farmers dime) we had a present in our room and it was 2 concert shirts and a letter announcing that Seattle’s own Train would be giving us a private concert the next night! I mean HOW COOL! 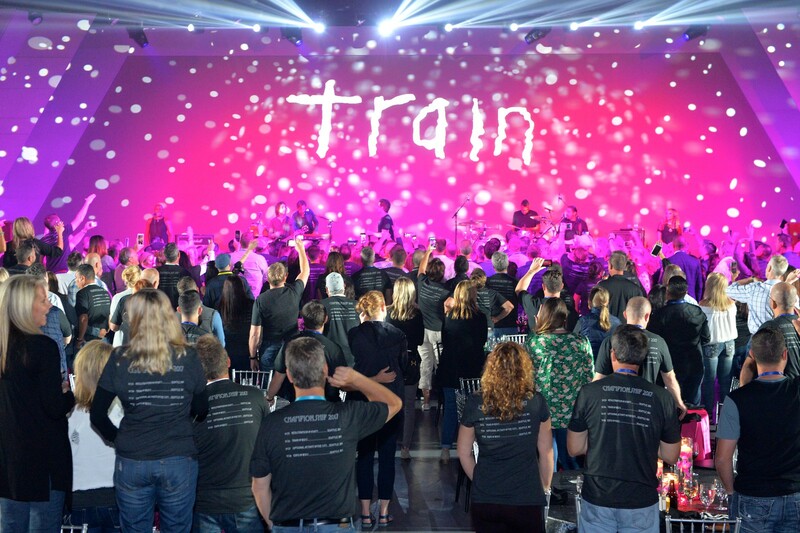 Heres the thing, I know Train… I mean everyone does. I wasn’t necessarily a fan but that night I decided to really get the most out of this…. so I got right up there front row and had a blast! They sang awesome covers, he brought out his daughter for one song and they were just awesome! 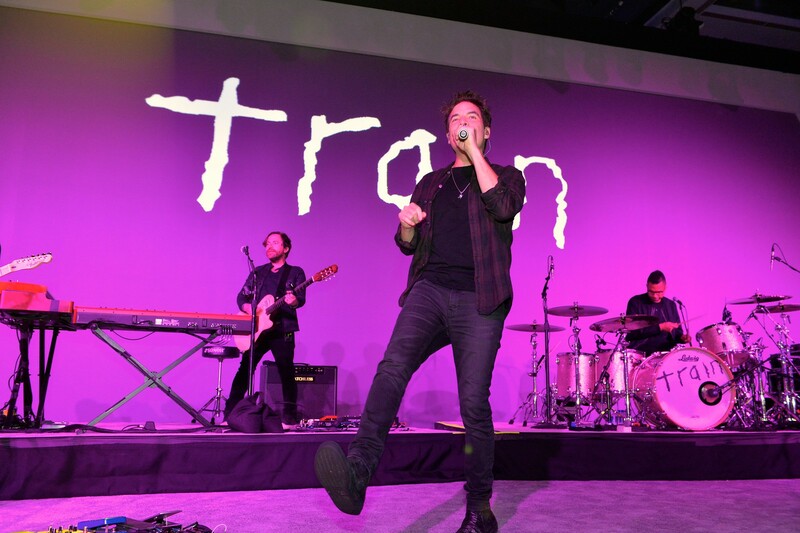 I mean a private concert with only a few hundred people was the best! Check out this photo the Farmers Photographer captured! Now, you see this shirt he is wearing……………..
Well here it is!! 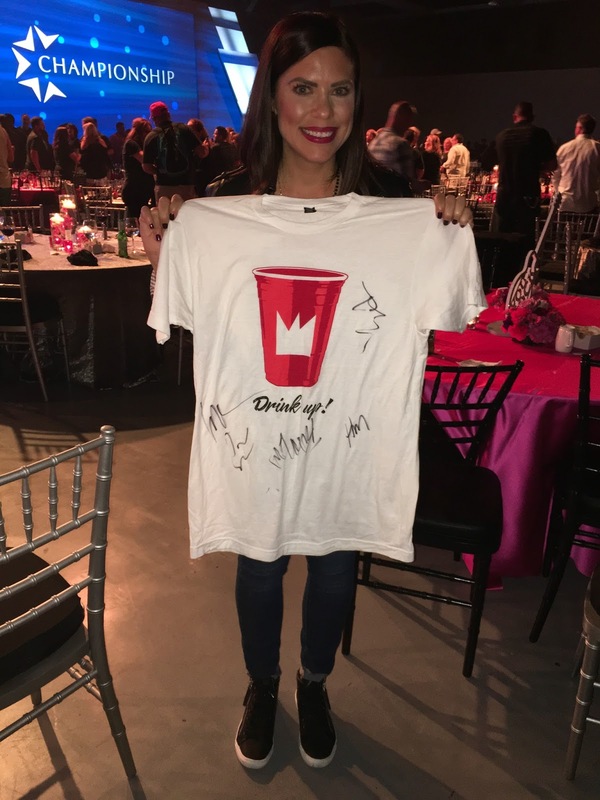 The entire band signed the shirt and I got it when it was tossed into the crowd! YAY ME! The last night in Seattle the weather was perfection and we were all bused to a secret location for our activity! 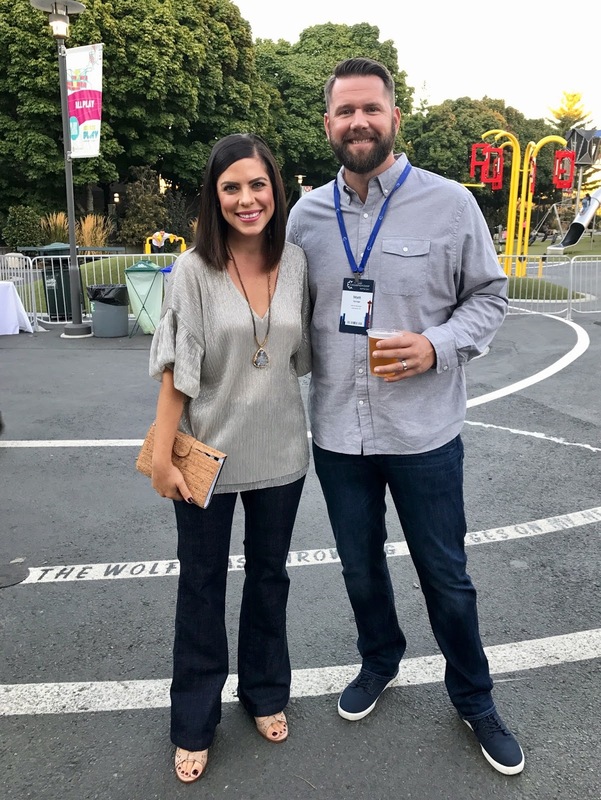 Farmers rented out the space under the space needle and set up a “Taste of Seattle” for us, local wineries and restaurants had booths and we had local live music! I loved how the space was set up with mix matched tables, rustic decor and flowers…. That stunning building in the background was part 2 of our night, Farmers rented out the Museum of Pop Culture. Inside the museum they had dessert stations set up through out liquid nitrogen pumpkin ice cream, truffle stations, homemade churros…. I know right? I was in heaven! 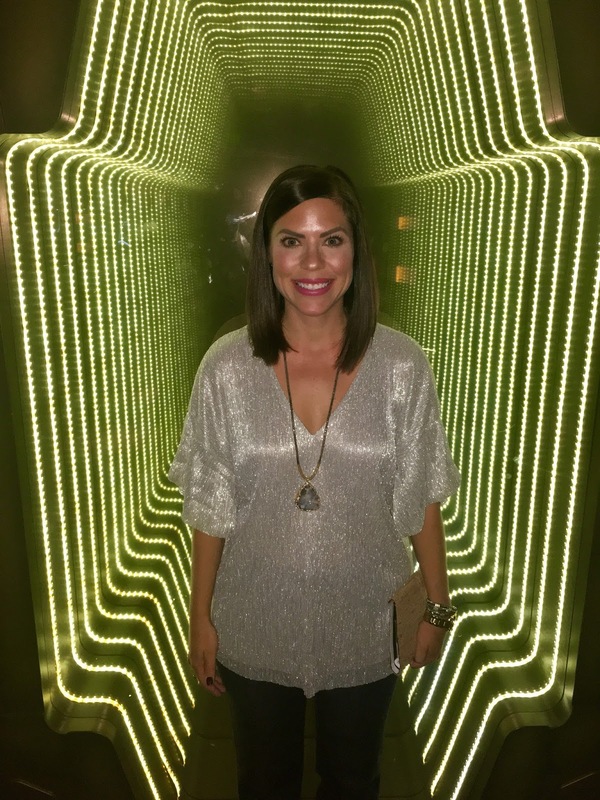 They had bars and a great DJ so we could dance the night away……. But for me…. touring the museum was pretty much the BEST THING EVER. I mean a museum full of movie memorabilia, music icons and a Jim Henson exhibit… I was so excited it was embarrassing! This smile does show it all……. They had original costumes like the one below as well as Princess Bride, Lord of the Rings, Narnia, horror movies and SO MUCH MORE! They devoted 2 floors to Star Trek this is the original set and costume from the movies……. Then I found myself in the Jim Henson Exhibit and my childhood dreams came true. Growing up I was OBSESSED with Labyrinth starring David Bowie. (Side Note! I wore a David Bowie shirt THAT day in Seattle) I watched that movie so many times growing up my Mom wanted to hide the VHS from me. So when I walked in and saw the costumes that David Bowie as the Goblin King and Jennifer Connelly wore in the movie I am embarrassed to admit it but I literally teared up. If you would have told my childhood self that one day as a adult I would be in the presence of costumes and memorabilia from that movie I would not have believed it. I know, I know, this sounds so silly but to me seeing this right here was the best thing I did ALL WEEK in Seattle. Also in the Jim Henson exhibit was the original Kermit, Oscar the grouch and SO much more. It was really neat… the exhibit was seeing parts of my childhood in person. And I have Farmers Insurance to thank for this. Guess what? 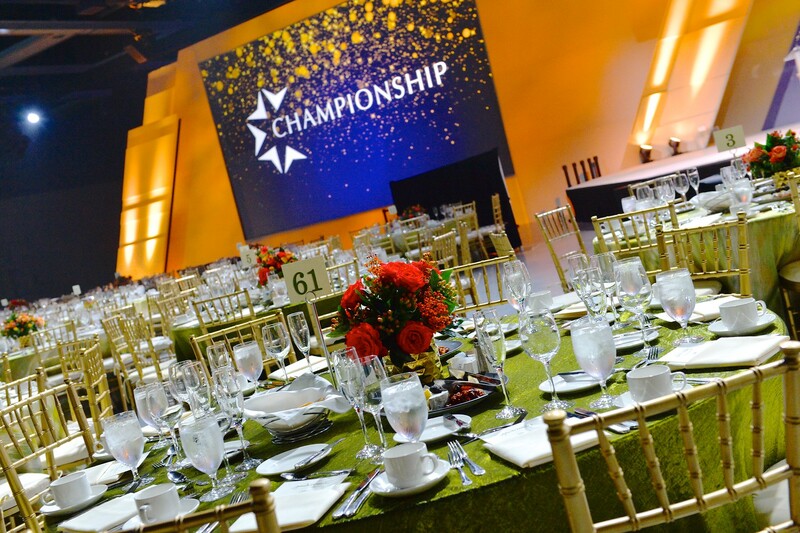 Farmers Insurance announced the achievement clubs for 2018 which happens to be the 90th Anniversary of Farmers Insurance and all clubs will be set in Cali for ONE WEEK… drumroll please……………. Farmers has literally closed DISNEYLAND for an entire day just for US (god, I hope we qualify). I am not kidding Disneyland will only be opened for only Farmers! Everything will be free inside the park for us as well. Holy moly! BUT that is not all……. They announced the 90th Anniversary concert and I died……….. CARRIE UNDERWOOD!!!! You heard me right next year the last week of September this all goes down. So send your positive vibes our way that we qualify….. we won’t know until March!! Thanks Farmers for a wonderful week!